Evolutionists fail to notice this caring design as they mischaracterize nature, misinterpreting creation as just a selfish mix of competitive “takers” who never “give back” to their local community. For generations, they’ve trumpeted death-driven cutthroat competition—survival of the fittest, natural selection, and selfish genes—as if death itself were the key to life on Earth. It is not.2,3 Death is not the “heartbeat” that regulates Earth’s human and animal inhabitants. Nature is full of proofs that God has programmed His creation, even in its fallen state, to exhibit neighborly helpfulness. One quick illustration can be found in Grand Canyon. Its sedimentary layers commemorate God’s cataclysmic condemnation of Noah’s contemporaries, yet the canyon also displays God’s current and continuing care for His creation. This is illustrated by the relationship between a certain tree, a fungus, and a cute furry animal. 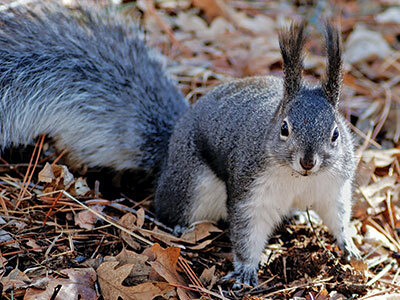 Grand Canyon’s mutual aid triangle is interactively formed by the tassel-eared squirrel, the ponderosa pine, and mycorrhizal “truffles” fungus. 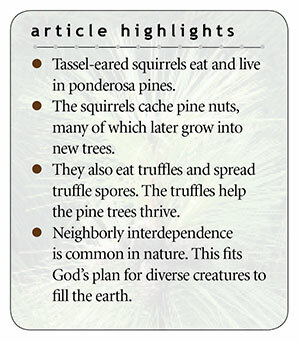 The triangular “win-win-win” neighborliness of Grand Canyon’s tassel-eared squirrel, ponderosa pine, and mycorrhizal “truffles” fungus quietly carries on day after day, month after month, year after year—mostly unnoticed by human observers. The trio’s interdependence is but one example of the complex relationships we find in nature that are engineered by God Himself. A deeper understanding of God’s world provides an effective counter to evolutionary mischaracterizations. “The heavens declare the glory of God”7—and so does the natural neighborliness at Grand Canyon. It doesn’t showcase a death-driven ecosystem, even though it’s happening on a fallen planet. Rather, this neighborliness quietly parades God’s continuing care for His creation. A deeper understanding of God’s world provides an effective counter to evolutionary mischaracterizations. See Genesis 1:22; 1:28; 8:17; 9:1; 9:7; Isaiah 45:18. Johnson, J. J. S. 2017. Cactus, Bats, and Christmas Gift-Giving. Acts & Facts. 46 (12): 21. Life on Earth originated in the living God, who loves life. So death is abnormal, like a home invasion. In fact, death will be destroyed as God’s last enemy (1 Corinthians 15:26). The curse of death is really abnormal, as is the fallen condition of Earth and its creatures. Disease, disharmony, and the universal wastefulness of entropy are not “very good” but are rather only temporary realities on Earth, pending future reclamation and restoration by its Maker, Maintainer, and Monarch, the Lord Jesus. Johnson, J. J. S. 1997. Providential Planting: The Pinyon Jay. Creation Ex Nihilo. 19 (3): 24-25. See also Kricher, J. C. 1993. A Field Guide to the Ecology of Western Forests. New York: Houghton Mifflin, 147-149 (reviewing mutual aid between pinyon jay and pinyon pine). Due to space limitations, only part of a food web will be considered here. Vail, T. et al. 2008. Your Guide to the Grand Canyon: A Different Perspective. Green Forest, AR: Master Books, 173. Cite this article: James J. S. Johnson, J.D., Th.D. 2018. Grand Canyon Neighbors: Pines, Truffles, and Squirrels. Acts & Facts. 47 (10).